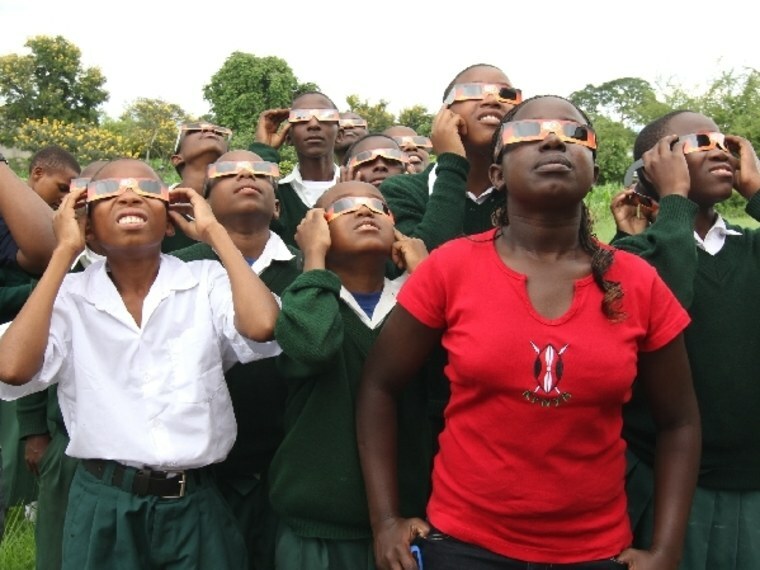 This year's only total solar eclipse, on Nov. 3, will be a beautiful moment for eclipse-chasers — and a teachable moment for tens of thousands of schoolchildren in Africa. To make the most of that moment, Astronomers Without Borders is gathering up donations to send those kids the glasses they need to watch the eclipse's progress safely. "This is a natural laboratory for science," the group's founder and president, Mike Simmons, told NBC News. "It's not something that anybody needs to pay for. It's brought to millions, courtesy of nature." So far, more than 8,700 eclipse-viewing glasses have been donated, but Astronomers Without Borders has gotten requests for more than 41,000. There's not all that much time to try to fill the gap, but Simmons says it's not too late to donate by credit card or PayPal. One dollar buys one pair of glasses. Next month's eclipse is what's known as a hybrid, which is a rarity in astronomy. Only 5 percent of all solar eclipses are hybrids. Because of the moon's changing position, this hybrid starts out as a "ring of fire" annular eclipse over the Atlantic, and turns into a total eclipse by the time the moon's shadow reaches Gabon on Africa's west coast. Totality will be visible only from a narrow track of land, stretching from Gabon in the west to Kenya and Ethiopia in the east. But most of Africa will see the partial phase of the eclipse, weather permitting. And that's where the glasses come in handy. Although the total phase of a solar eclipse can be viewed safely with the naked eye, no one should ever look at a partial solar eclipse with unprotected eyes, even if only a sliver of the sun is showing. Simmons hopes kids across Africa will get that message, and get the right kind of eyewear as well. "There's always a lot of education to do with eclipses," he said. "Even with the last couple of eclipses in Australia, there was a lot of misinformation." Africa poses special challenges. "These are areas where science education is very difficult, simply because of the lack of resources," Simmons said. To make sure the glasses get into the right hands, Astronomers Without Borders is partnering with the International Astronomical Union's Office of Astronomy for Development, which is based in South Africa. The IAU has agreed to distribute the glasses as part of its 10-year strategic plan to promote science education in the developing world. Some of the folks in the Astronomers Without Borders network, plus an allied group called Telescopes to Tanzania, are facilitating transport. "We're sending them with eclipse-chasers who are going to countries where the eclipse will be visible," Simmons said. "Some will go as late as the 28th." Simmons' big problem is that he's getting so many orders for the glasses from African schools that he can't fill them all. "We could easily do 75,000," he told NBC News. "I don't think that's going to happen due to the short amount of time, just logistically." But every pair of safety specs helps. Stay tuned for updates about the hybrid eclipse and how to see it online as the big day approaches.